The "minor" changes of sequence, event, and emphasis to Shakespeare's play are of course not only that: they mean a recalibration of significance, requiring more mental gymnastics from me. The matching of voices to the characters I assumed I knew so well was also curious. James Morris was a gravelly-autocratic Claudius. Gertrude was (I think) still a somewhat boring, stupid, manipulative character (sorry; I've never liked Gertrude; can you tell?)... but Jennifer Larmore's electrifying voice and stage presence sometimes seemed to belie that! 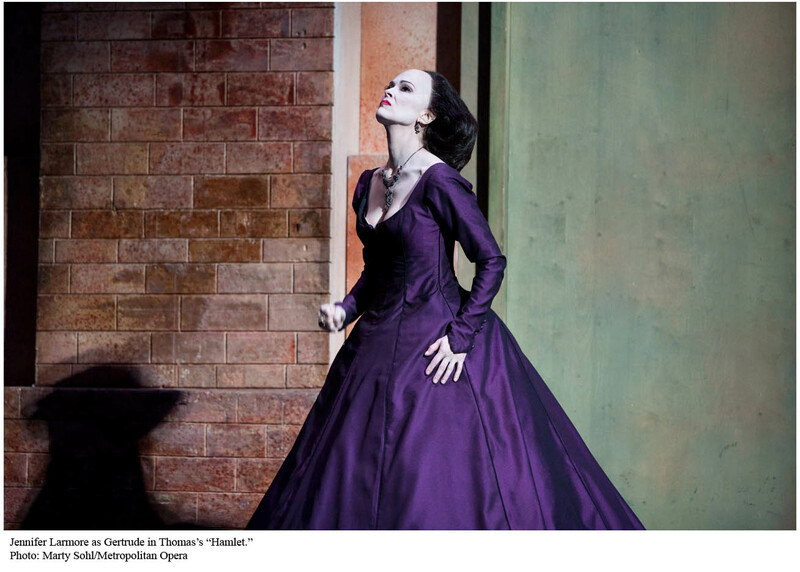 Ophélie was sung, and sung well, by Jane Archibald in her Met debut! So much coloratura. And the love duet was exquisite; poor thwarted lovers--they could have been happy! She seemed a little emotionally detached... but perhaps this was poor Ophélie's coping mechanism. The inexplicably fidgety house quieted down, I was happy to note, for her mental collapse, which was agonizing... a much more violent undoing than lilting songs and scattered rue and rosemary. Hamlet, also, not only says "être ou ne pas être! mystère! " instead of "to be or not to be" etc. ; he has become a 19th century Romantic hero instead of a Renaissance philosopher-prince. The essentials, of course, are still there, and Simon Keenlyside embodied them, as a noble man who, in this staging, after running out of a scene which had become unbearable, or beginning to do so, would force himself to turn back, to comfort Ophélie, or say the last words that needed to be said. I was so impressed with Keenlyside. Not only does the man have to sing a demanding baritone part... he has to play Hamlet! I'm willing to bet I wasn't the only audience member with Olivier's prince very much in mind. But Keenlyside was captivating: from first to last almost unbearably expressive with his voice, and physically fearless. 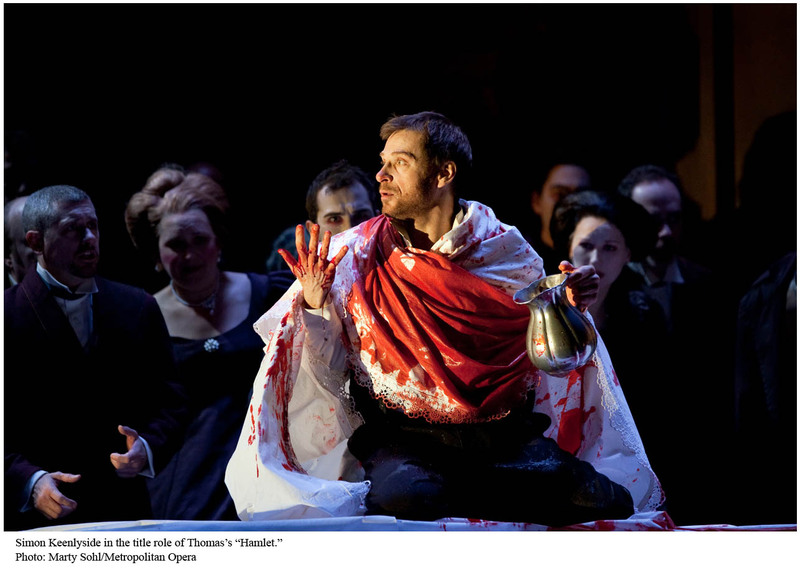 (Parenthetically, Anthony Tommasini of the New York times calls Keenlyside "the Ralph Fiennes of baritones." I find this moniker deeply confusing, but thought I'd share it because it fascinates and amuses me as well: what can this possibly mean? that they both have bony-attractive faces? unnerving clear eyes? a somewhat tortured dreaminess? Food for thought, this.) Anyway, I thought he was brilliant: a man of strong character on the edge of disintegration. The rest is silence. Well, I´ve seen "The English Patient" 5 times at the movies for no other reason than Ralph Fiennes, and I can´t see a similarity to Keenlyside. "Strange days", another great movie, but..no, still no Keenlyside! (But Keenlyside is a great singer, and Fiennes is not). Oh, I'll have to look for "Strange Days," which I haven't seen. "The English Patient" is one of my favorites, too. But I agree, I don't quite see where Tommasini was going with the analogy between operatic baritone and stage-and-screen actor... Ah well, we can continue to enjoy both of them! 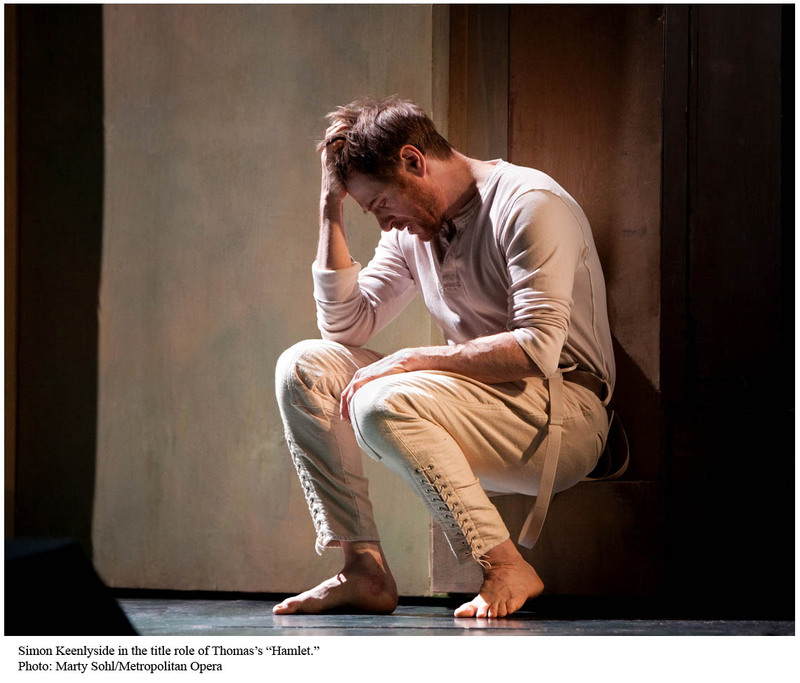 i thought very highly of his acting in Hamlet too, incredibly good (not only) for an opera singer. and it seems he just is a good actor, i have now many of his CD´s as well as DVD´s. (but not only his, i bought much more and subscribed to met player:-)) ).